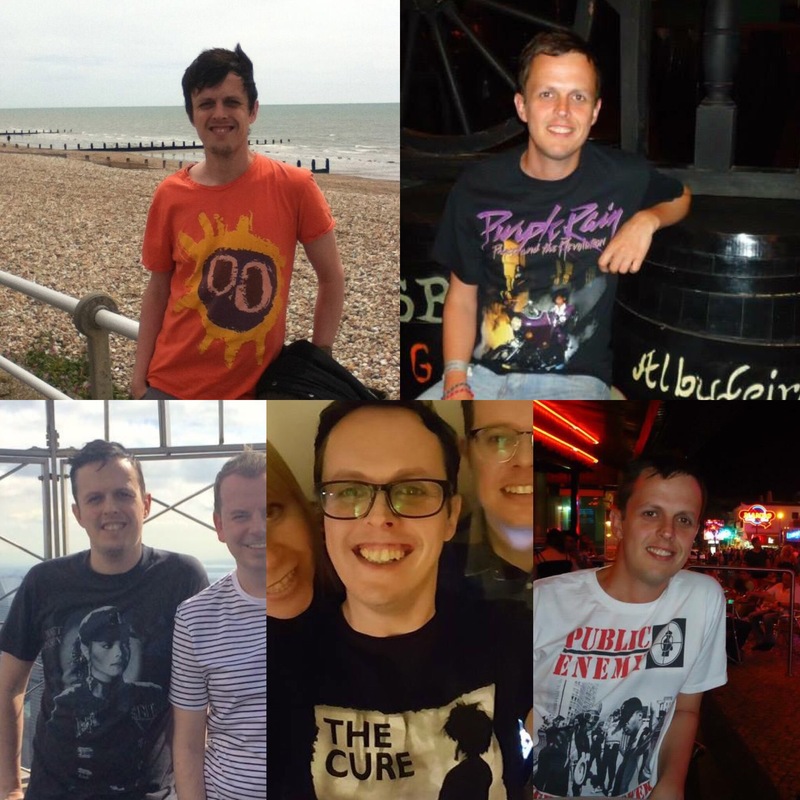 Like most music lovers, a large percentage of my wardrobe features the faces and album covers of various different bands and singers. I’ve been buying music T-shirts since I was young and over the years I have built up quite a collection. Every now and then I’ll dig out an old gem that I haven’t worn for years. A few weeks back I found an old Janet Jackson ‘Rhythm Nation’ tour tee. I bought it at a concert at Birmingham, the first gig I ever went to, I’d have been about twelve or thirteen. It’s brilliantly retro and because I’ve not worn it in so long was in surprising good condition. What was even more surprising was that it still fit. I started wearing it again on my recent trip to New York. Others didn’t wear so well. I recently bought a brand new The Cure tee, that I bought to replace one that I got at their Wild Mood Swings tour back in the nineties. Sadly because I wore it so much as a teenager, there was a little more than threads left of it. The same goes for my Tori Amos ‘Little Earthquakes’ tour tee, from the first time I saw her. It’s great that I have been able to replace these old faves. I’ve also invested in brand new T-shirts of bands that I used to love back in the day too. A couple of years ago I bought a T-shirt featuring the album artwork from De La Soul’s ‘3 Feet High and Rising.’ It’s an album I loved back in the day and probably one of the first that gave me my life long love of Hip-Hop music. There were so many great artists and bands of that genre when I was growing up; Beastie Boys, Run DMC, Snoop Dogg. I own clothing with all these guys faces on them. Many of them bought from gigs, or from record shops when the album came out. But here’s the strange thing. A few of these were bought recently from high street clothing shops. High street clothing stores have started selling retro music T-shirts. A few years ago it was old skool Hip-Hop bands. My De La Soul tee was from one of the larger shops. Now the same store, amongst others seems to have moved the trend on. Retro Rock is big right now. Bands like Nirvana, Metallica and Guns n Roses are returning to the public consciousness, but not for their music. The logos we once associated with great, trailblazing music have become little more than brands. I’m not really sure how I feel about this. Having loved these bands when they first emerged and remembering the buzz that surrounded them, it seems strange seeing people in their teen years walking around in this clothing. I wonder if this was the vision that Axl Rose or Kurt Cobain had when they first emerged on the scene. Probably not. However, I realise the hypocrisy in what I’m saying. When I was about fifteen or sixteen, a TV commercial came out for a jeans company that featured a song by 70s glam rockers T-Rex called ‘20th Century Boy.’ I fell in love with the song. The campaign typically came with the release of the band’s greatest hits. I bought the album and discovered a whole load of amazing tracks by a band I had previously not heard of. To me they were new and exciting songs, despite the fact they were twenty years old. My obsession continued beyond the hits and whenever I went to record fairs, I’d pick up old albums from their back catalogue. I also walked around in a T-shirt with a picture of front man Marc Bolan on the chest. I loved this band, despite the fact that Bolan died a few weeks after I was born. I guess in many ways it’s great that these bands are still loved. Music isn’t just for the generation it came out in. I’ll always love those bands from the nineties because I remember the excitement that surrounded them and the emerging scene they came from. But great music stands the test of time and should be enjoyed by generations to come. There’s nothing wrong in a sixteen-year-old boy wearing a Nirvana T-shirt, as long as he loves the music and not just wearing it because he liked the design and thought it looked cool. I’m so glad these bands are continuing to be known years after their hey day. Great music transcends time. I know people who have brought their kids up on the music they love. If I ever had kids I would make sure they listened to every track Prince ever released. My parents force fed Abba and The Beatles. Growing up I rebelled against their music and to this day can’t listen to any of those bands. I’d be stoked if my kids shared a love of Nirvana and Pulp. I saw a child no older than three or four today in a Guns n Roses T-shirt, I assume the parents must have been fans. I can’t imagine he sings along to ‘Paradise City’ or ‘November Rain’ when he’s not sucking on his dummy, but praise to the parents trying to pass their music down. If you love a band, then put them on your chest and be proud. But please love the music. These bands are so much more than the logos that represented them.